This pioneer farmer Augustus Merideth Wilson became one of Collin County’s most generous philanthropist of his day, giving away nearly $800,000 before his death. During his lifetime Augustus “Uncle Gus” Wilson gave away $800,000 making him one of the most generous philanthropist McKinney has ever known. To put that amount of money in perspective, in 1927 it cost about $125,000 to remodel the courthouse from its French Second Empire style to its current Neo-Classical Revival style. A 1936 Ford sedan with a V-8 cost $510. 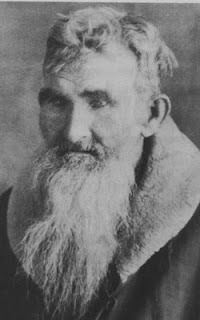 Uncle Gus was born in Tennessee in 1845 and moved to McKinney as a young child with his parents Addison and Ann Wilson. He lived an modestly wearing his overalls and sporting a long beard no matter how formal the occasion. Though penniless in appearance, he made money hauling lumber from Jefferson by ox-cart. His experience the transport business made him keenly aware of the value of railroads and made some stock investments that turned out well. Story’s abound about Uncle Gus’s generosity. He gave away cash, cars, and homes. He supported many churches and schools. He was especially generous to industrious people who didn’t ask for help, often helping them without them knowing about it. At his death in 1935, the Texas State Senate passed the following resolution as a memorial to him….. WHEREAS, There has come to the attention of this body the death of A.M. Wilson, distinguished philanthropist of Collin County. WHEREAS, This illustrious citizen has during his lifetime distributed among his fellow citizens his entire fortune of $800,000.00 among worthy citizens and for worthy purposes; WHEREAS, He has paid salaries of school teachers when this state failed to pay them; WHEREAS, He has built churches without regard to denomination, built school houses, saved farms from foreclosure and has been a helpful friend to the poor and oppressed; therefore, be it RESOLVED, That a committee of three members of this body be appointed by the presiding officers of this body to procure and have prepared a portrait of said A.M. Wilson and that it be hung in this Senate chamber as a guiding inspiration to aid in bringing about unselfish service in behalf of the needy and that $500.00 or so much as may be necessary, be appropriated out of the contingent fund for that purpose.